Our Essential Collection this time out finds us greeting one of the greatest cornettists of the 20th Century, perhaps not as universally well known as Bix Beiderbecke but arguably as great a musician. 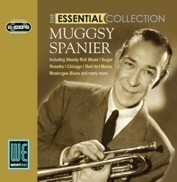 Muggsy Spanier was born to French and Irish parents in Chicago in 1901 and following his career we can almost trace the history of jazz itself, from New Orleans to Chicago to the West Coast via Dixieland to Big Band Swing and Be Bop to small band units. It was in Chicago that Muggsy heard all the early jazz greats from the legendary Dixieland Jazz Band itself to the New Orleans Rhythm Kings and the mighty King Olivers Creole Jazz Band, soon to be joined by a young trumpet player called Louis Armstrong! It was in fact Olivers cornet that appealed to the young Muggsy and he duly took up the instrument he was to go on to make his own. Our superbly re-mastered double CD contains tracks from throughout his career starting as far back as 1924 with the Bucktown Five. We follow him into the Ted Lewis Band where he was the featured hot soloist and then jump ahead to 1936 where we find Muggsy with the Ben Pollack Orchestra. By 1939 Muggsy Spaniers Ragtime Band was in full cry until the mid 1940s when musical fashions changed and he found himself joining the Bob Crosby Orchestra. The 1940s continued to see Muggsy switching bands from Crosby to Milt Gablers Commodore label band and back to Ted Lewis where the one consistent was the swinging sound of his cornet featuring alongside legends such as Miff Mole and Pee Wee Russell. In the 1950s he again formed his own band and went on the road playing good jazz standards and popular songs with the inevitable changing line ups. By 1957 Muggsy had moved to the San Francisco area settling down with his wife where he found steady work with the locally based Earl Hines band. He led a relatively quiet life until his death in 1967. As last except Bob Casey (bs) replaces Palmer.